Did Technology Wreck the American Middle Class? 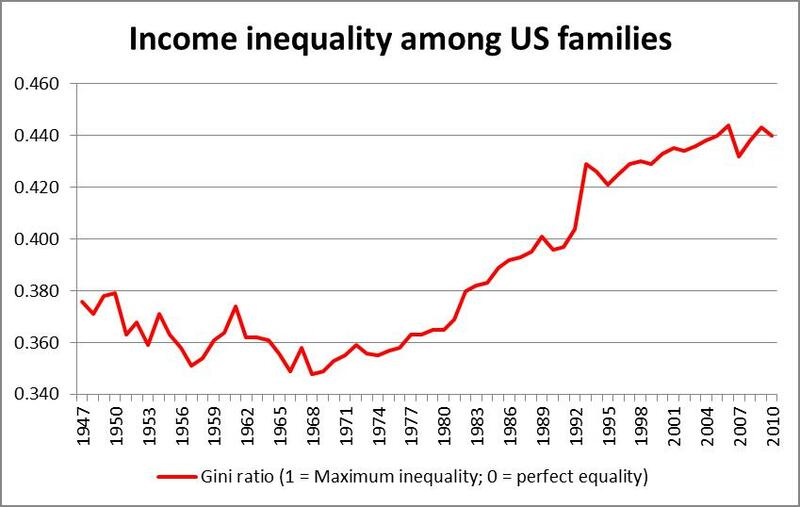 Rising income inequality in the United States has become big news over the last few years. Sociology and left political economy have always seen inequality as a structural outcome necessarily produced by the normal operation of capitalist economies. The recent concern shown by mainstream economists and some politicians is more curious, given that – with the exception of a three-year period in the 1990s and again in the 2000s – income inequality has risen steadily from 1968 to the present. Inequality has also been a central topic of modern mainstream labor economics, but it has been seen either as an individual issue associated with unequal possession of skill (“human capital”) or an impersonal issue associated with the forces of supply, demand and technological change. It has been not been theorized within economics as an inherent, structural problem of market economies. Recent attempts by mainstream labor economists to explain rising rising inequality have focused, with remarkable consistency across accounts, almost entirely on the role of technology. In other words, in economic explanations of rising inequality there are no capitalists making investment decisions, no managers making employment decisions, no ideology of shareholder value, no forces of destructive competition. Only technical change, supply and demand. The standard economic theory, referred to as skill-biased technical change, has been that due to the spread of information and computer technology, demand for workers with high-tech skills has risen faster than the supply, thus generating a wage premium for workers possessing such skills. This theory has been widely criticized, even from within economics, for its inability to explain the brief reversal in the 1990s, despite continuing advances in computer technology, or to explain the fact that the gender wage gap has been reduced while the racial wage gap has remained stable. Computers excel at “routine” tasks: organizing, storing, retrieving and manipulating information, or executing exactly defined physical movements in production processes. These tasks are most pervasive in middle-skill jobs like bookkeeping, clerical work and repetitive production and quality-assurance jobs. In short, robots can replace jobs that involve routine tasks, which happen to be in the middle of the income distribution, but they can replace neither high-end jobs nor low-end jobs, both of which involve non-routine tasks. The result has been a polarization of the labor market into high-wage and low-wage jobs. Now, I have read Autor’s academic work on these issues very carefully; his logic is impressive and his methods innovative. He and his coauthors have presented sound evidence in support of their theory of technically-generated job polarization, which is key driver of income inequality. Based on one measure of routine manual tasks (finger dexterity) and one of routine cognitive tasks (sets limits, tolerance or standards), they show that there has been a large decline in the average intensity of routine tasks within the overall occupational distribution over time. While this is certainly an interesting finding, their theory misses the sociological fact that investment decisions regarding technology and managerial strategies regarding employment are made in specific institutional, political and cultural contexts. In the real world – as opposed to economic theories in which investment and managerial decisions are modeled based on implausible theoretical assumptions – managers do not generally maximize efficiency as if they were computers. Rather, investors and managers are human beings who conceptualize their world through cultural and political ideologies, typically attempting to make satisfactory profit (which does not always require making efficiency-improving choices). In a recent academic paper, I found a puzzle in the employment data that can only be explained in terms of a sociological theory of changing managerial ideologies within class politics. I coded 840 detailed occupations from Census data into one of four job types: high-skill autonomous work (e.g., executives and professionals), semiautonomous work (e.g., supervisors and secretaries), tightly constrained work (e.g., clerks, cashiers, assemblers, and machine operators), and unrationalized labor-intensive work (e.g., waitstaff, cooks, nursing aids, and janitors). The latter two types – tightly constrained and unrationalized labor-intensive jobs – are low-skill by definition. Given the growth in low-wage jobs that Autor and others have documented, we would expect to see a rise in low-skill work, which according to standard economic theory (including Autor and Dorn) would underlie the rise in low-wage work: because there is an excess supply of workers who can perform low-skill work, wages will be pushed down. However, I found that from 1960 to 2005, there was a 15% decrease in the low-skill job share of the employment structure. In brief, the proportion of low-skill jobs declined while the proportion of low-wage jobs rose. The rise in low-wage jobs is therefore likely a combination of some higher-skill jobs receiving lower wages and, I want to suggest here, a change in the institutional structure of the economy such that certain low-skill jobs used to receive decent wages but no longer do. The institutional context of the 1950s and ‘60s, the US was a nationally-bound economy in which a core of large manufacturing employers engaged in oligopolistic competition. In this context, corporations understood their business interests to include not simply maximizing shareholder value but also sales growth and market share; as sociologist Neil Fligstein has shown, corporate governance was managed with an emphasis on sales and marketing. In terms of employment, a dominant logic of internalization was seen as best practice, including the internalization of activities, the development of internal labor markets, and the protection of workers from market forces. As a result, many low-skill jobs in large manufacturing corporations provided security, opportunities for training and promotion, and decent pay through administratively-determined wages (patterned on union contracts in the auto sector) that were associated with positions rather than individual workers. As corporations faced intensified competition and declining profit rates under the growing internationalization in the late 1960s, there was a shift to the shareholder value ideology of corporate governance and a new logic of employment externalization. This included outsourcing, downsizing, and lean staffing strategies (which reduced opportunities for training and promotion); deunionization; part-time and temporary employment; and a return to market-determined wages even for full-time, long-term jobs. Shareholder value was part of a broader shift in the investment orientation of capital, and employment externalization part of a transformation in how workers are managed. Investment by US corporations and financiers was increasingly focused on offshore manufacturing, domestic services, and global financial speculation. In terms of the domestic economy, the dominant employment sectors are now high-end professional and business services, and low-end retail trade, leisure and hospitality. It is surely the case that technical change has played an important role in facilitating – and in some cases even driving – rising job polarization and inequality. But if we want to understand the fundamental forces generating these outcomes, we have to focus on the investment decisions of capitalists and the ideologies of management. The American middle class has not been devastated by the impersonal march of technology, but by a small class of wealthy individuals financing corporations and making sure they are run in the interests of investors, with no other interests in mind.